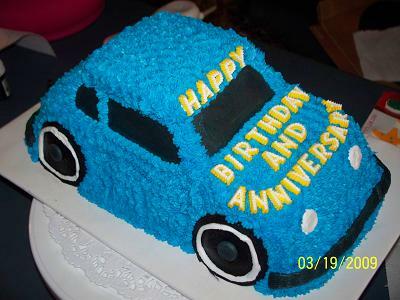 to make this car cake, I used the crusier cake pan and did as Nancy suggested and added extra cake mix. And with the left over mix I made a few cupcakes. I don't care much for this pan. Sorry Wilton. It took over an hour for it to cook through and the tires look terrible.... so next time I will use oreo cookies for wheels. I used buttercreme icing and used black for the glass and bumpers and wheels and white for the headlights and blue for the car itself. I used the pre-made candy letters to write my message. This was for an older couple who were celebrating their anniversary and his birthday.